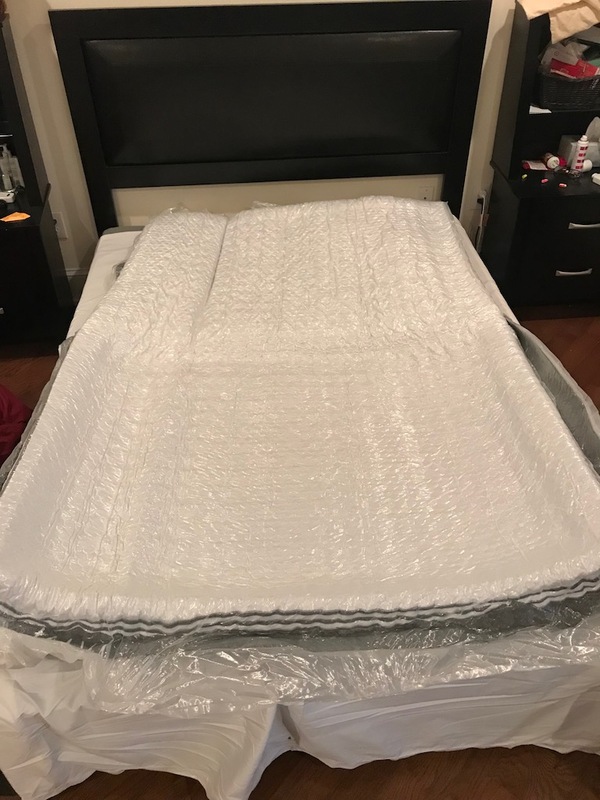 This KAYA Mattress Review was recently completed by the MattressJunkie.com team. KAYA Sleep’s goal with the Kaya Mattress was to build the most premium, most durable mattress on the market. All KAYA Mattresses are made in the USA and all foams used are Certi-PUR US certified. KAYA combines unique cooling technology, edge support, and high density foams to maintain a high-quality sleeping surface that’s durable enough to last year after year. 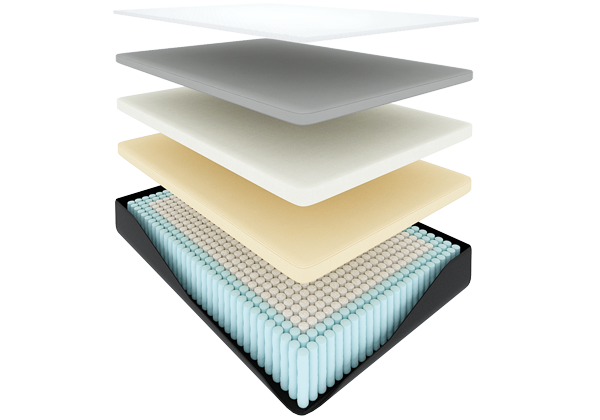 The KAYA Mattress combines a highly responsive layer of memory foam with pocketed coils to give the sleeper the best of both worlds. Check out what we thought about the hybrid KAYA Mattress below. Tell me more about the Kaya Mattress cover. The KAYA Mattress has a Thermo-gel infused cover that was created in one continuous knitting process. The KAYA Mattress cover is designed to stay ultra-cool throughout the night. Personally, we love the Thermo-gel cover. Gel infusion makes a huge difference in heat retention and dissipation throughout the night. What’s Under Kaya Mattress cover? The KAYA Mattress is considered a hybrid mattress and has 4 layers under the mattress cover. The KAYA Mattress is 11 inches in height. Layer 1 is comprised of responsive high density memory foam. This 1 inch layer of 5 lb. responsive high density foam is designed to provide comfort. Layer 2 is made up of 2 inches of 4lb memory foam. This layer of memory foam is responsible for providing pressure relief and support for the sleeper’s body. Layer 3 is a 1 inch layer of 2lb. transition foam. This foam layer provides additional support for the other layers and enables deep compression support. Layer 4 is a 6-inch layer of pocketed coils that sit on a 1 inch layer of stabilizing foam. Over 1,000 pocketed coils made from top grade steel. The pocketed coils are sandwiched between two layers of stabilizing foam. The pocketed coils provide excellent edge support and do a great job controlling motion for those who don’t sleep alone. Edge support is a common complaint with memory foam and hybrid mattresses. For those who use the entire mattress surface to sleep or use the edge of the bed for sitting, edge support is very important. The caving in feeling that you get with many mattresses as you approach the edge, does not happen with the KAYA Mattress. KAYA Sleep does a great job alleviating that common nuisance. The individually pocketed coils also play a huge role in motion transfer. Individual coils absorb the motion from pressure so the whole sleep surface is not disrupted when one person moves. What Sleep Style Works Best with the Kaya Mattress? The KAYA Mattress is listed as a medium firm. The KAYA feels like a medium to me but the pocketed coils play a huge role here. The coils stop the sleep from sinking into the mattress so you get the proper support with a comfortable sleep surface. 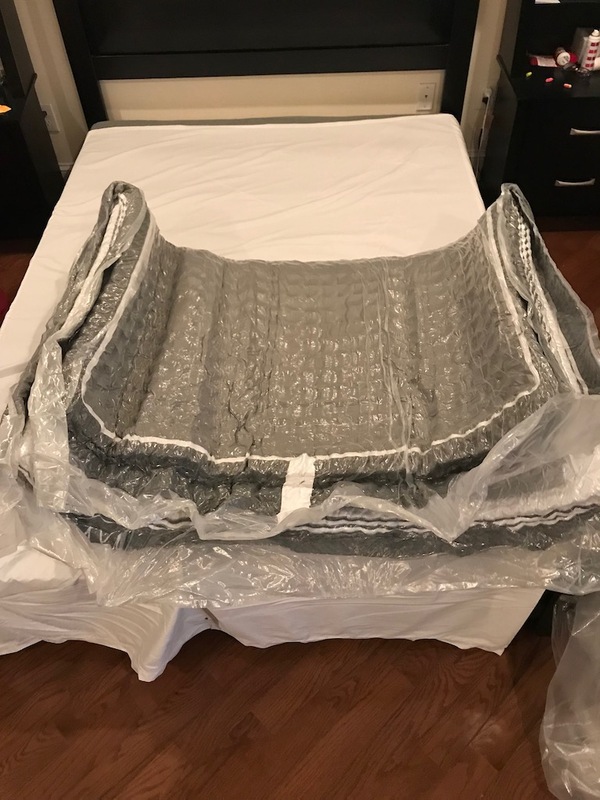 What type of base should I place my Kaya Mattress on? 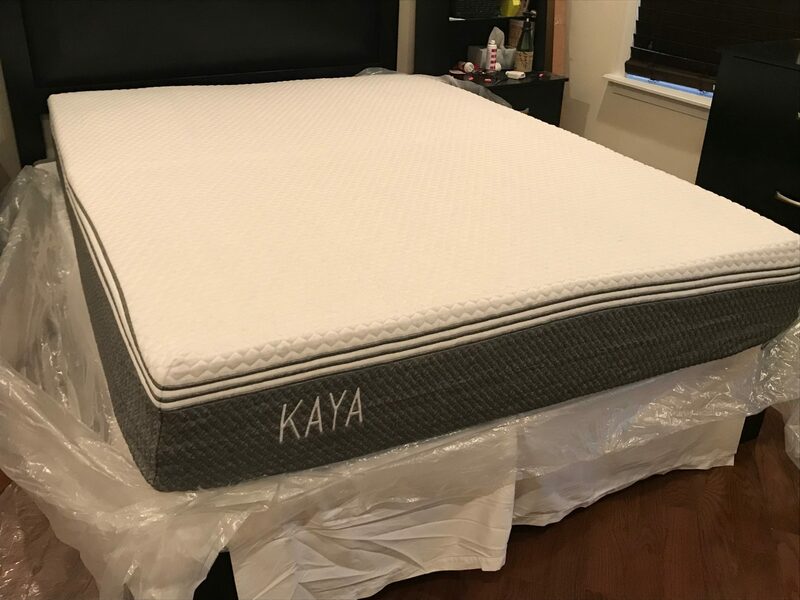 We reviewed our KAYA Mattress on a regular bed on top of a box spring. Any flat surface such as a box spring or platform bed would work fine. Most mattresses have an odor to them when you unroll and remove the vacuum sealed plastic. This “new mattress” smell is called off-gassing. Off gassing is not harmful nor toxic in any way. As your mattress breathes, the off-gassing smell will fade. The KAYA Mattress had little to no smell when opened. 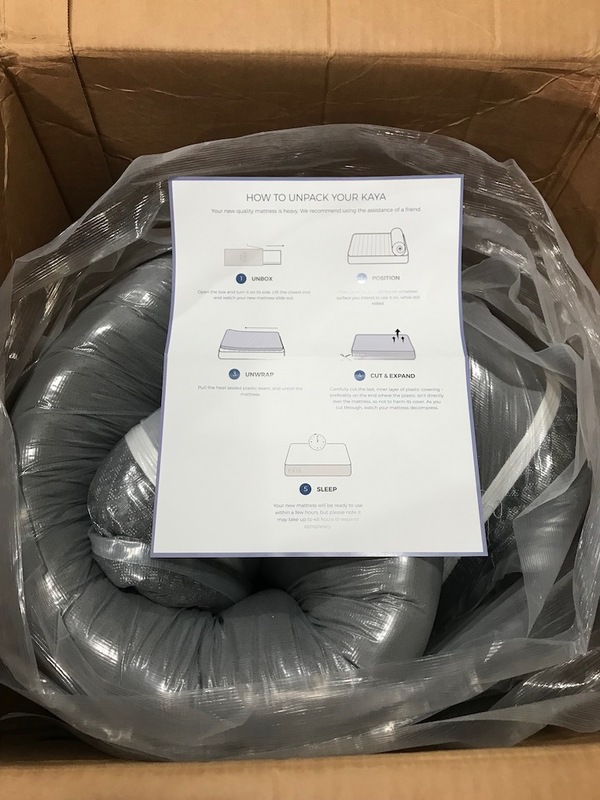 What Type of Warranty and sleep trial Does Kaya Mattress Offer? KAYA Sleep offers a 20-year warranty and 120-night, risk free sleep trial on the KAYA Mattress. KAYA offers free shipping and returns so the consumer is completely risk free when they purchase a KAYA Mattress. How much does the Kaya Mattress cost? Do we recommend the Kaya Mattress? The KAYA Mattress is one of my favorite hybrid mattresses to date. The support is top notch and the top foam layer is very comfortable. 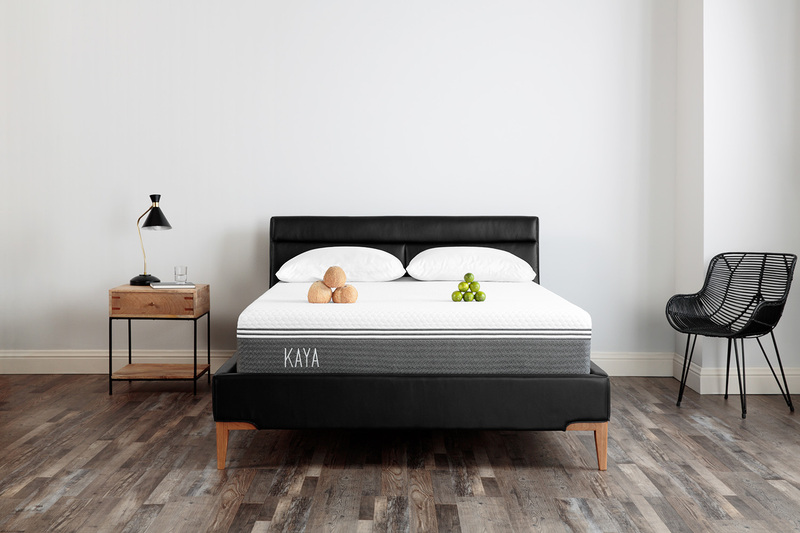 If you sleep hot and don’t like memory foam mattresses, the KAYA Mattress would be a great alternative for the best of all worlds. Order Your KAYA Mattress here…..